In the water, the main predators of penguins are killer whales and seals, while their young are commonly preyed upon by skua seabirds on land. One particular species of penguins called little penguins, are a food source to some introduced species, such as cats, dogs, rats, weasels and foxes. 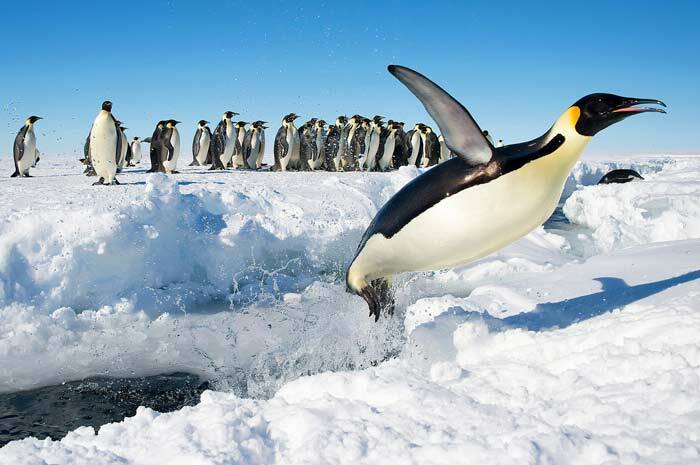 Penguins are flightless birds that live in colonies in the Southern Hemisphere, although one species is found near the equator in the Galapagos Islands. These animals are exceptional swimmers and primarily feed on fish, krill, squid, mollusks and other crustaceans. Before they eat, penguins are known to check for the presence of predators by pushing one penguin into the waters and waiting to see if the penguin is attacked by a seal. One special adaptation of penguins is their excellent eyesight in the water, which allows them to steer clear of their natural predators.